The Roving Racers are a quartet of Koopa Troopas that appear in the game Super Mario Odyssey. They wear caps that correspond to their shell color and race Mario across the different kingdoms in a minigame called Koopa Freerunning. Mario can collect a Power Moon for coming first place in the race and can rematch them for another Power Moon after hitting the Moon Rock, with a gold Koopa replacing the purple Koopa. This new racer tends to take shortcuts and can perform moves that Mario can, such as the Cap Throw and capturing enemies, and can ride Jaxis. 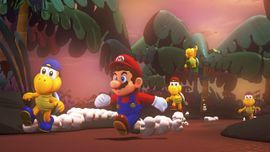 They race Mario in a very similar vein to Cosmic Mario from Super Mario Galaxy, and their role is reminiscent of Koopa the Quick from Super Mario 64. Mario must find the green Racing Rover in order to participate in the race. If Mario goes near the green Racing Rover while capturing an enemy, it will complain about how he doesn't have time to deal with it. This page was last edited on March 12, 2019, at 21:12.